Delphi Technologies PLC (NYSE: DLPH), a leading provider of advanced propulsion solutions to global vehicle manufacturers, today released its annual worldwide vehicle and motorcycle emissions standards reference booklet at the 2018 International Vienna Motor Symposium. For more than a quarter of a century, Delphi Technologies has been tracking and compiling emissions regulations from around the world to release them in an easy-to-read summary. 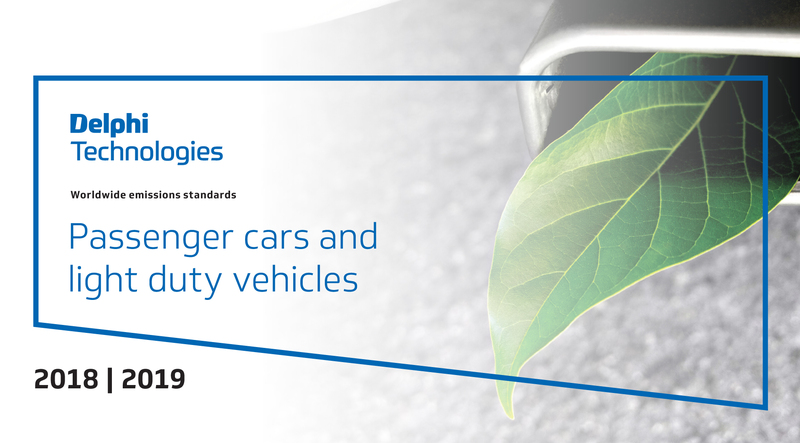 This compendium is invaluable to vehicle and engine manufacturers, as well as other industry professionals, as a single trusted guide to the complex and evolving global emissions standards. Included in the 2018-2019 edition is an overview of the Worldwide Harmonized Light Vehicle Test Procedure (WLTP). Going forward, vehicle emissions in the Europe Union will be measured over this test procedure instead of the New European Driving Cycle (NEDC) which was originally designed in the 1980s. Compared to the NEDC, the WLTP cycle includes more speed phases as well as higher average and top speeds. It is intended to better represent the emissions and efficiency of vehicles in a more authentic environment. By September 2018, the new WLTP certification will be compulsory for all vehicles sold within the European Union. The 2018-2019 edition passenger vehicle and motorcycle emissions standards booklet is available to download here.